The City of Harrisonburg and Harrisonburg Downtown Renaissance will be honoring our nations heroes at the annual Veterans Day Celebration in downtown Harrisonburg. On Sunday, November 9, head to Main Street for a parade beginning at 2:00 PM. Flags will line the streets and patriotic floats will glide through town, marching bands will fill the air with music, a convoy of military vehicles will drive through, and more! 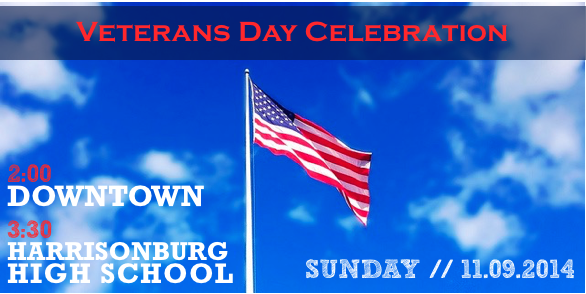 Following the parade, at 3:30 PM, a ceremony honoring the veterans will take place at Harrisonburg High School. As part of the ceremony, the high school’s music department will present a Veterans Day Concert at 4:30 PM. The Harrisonburg High School Symphonic Band and Honors Choir will perform patriotic works celebrating the men and women who have served our country. Looking for more information? Check out HDR’s website. Lisa is the creative mind behind The Harrisonburg Homes Team, providing streamlined content management, quality authorship, and graphic design for Harrisonblog. She's passionate about blogging, enjoying life, and a good cup of coffee. The Harrisonburg Homes Team is proud to be a part of Kline May Realty, 83 South Main Street, Harrisonburg, VA 22801. Licensed in Virginia. Read up on the particular project you would like to accomplish. If you’ve never refinished hardwood floors, you’ll want to research the ins and outs of that topic! Purchase (or borrow!) the right tools for the job. Using the right tools will make your job a whole lot easier, and if you borrow from a friend or neighbor, that person will likely give you some advice on how best to go about your project… and might even lend a hand! Go to a free workshop at Home Depot, Lowes, or the like. The folks that teach these mini-classes have the experience and expertise to get you started. And they are always available to answer questions along the way. Pick the brains of your friends and neighbors. Have they worked on a project like this? You’d be surprised how many people you know that have worked on their own home improvement projects. Get ideas from showrooms, friends’ homes, magazines or online photo galleries. It will get your creative juices flowing and you’ll likely be able to find some sort of inspiration for your project. Come up with a plan and a budget. It is really easy to have your project get away from you. Make sure you stay on task (no one likes an unfinished project!) and stick to your budget. While you are planning, you will want to see how much tools and supplies are going to cost you so you can come up with a reasonable budget — and to determine whether or not you can actually afford to finish the project! Finally, take before and after photos of your project. You can use these for motivation to move on to the next project, to show your friends what you’ve done (it doesn’t hurt to gloat sometimes, right? ), and to show future buyers when you sell your home. It will show that you have added value to the property. Have you worked on a DIY project? How did it turn out? What was it? Do you have any more tips for getting started… and finishing? Let us know!